Had the long term plan for this country's Carnival, put forward by former General Manager of the Trinidad and Tobago Tourist Board, Don Bain, in the 1950s been followed through by the then and successive Governments, our Carnival would have rivalled that of Brazil's, and been an even greater earner of foreign exchange than it is today. Bain had argued that Carnival, rather than being regarded simply as a two-day Festival, should instead have been viewed as a month long Season incorporating then existing as well as specially organised related Carnival events, including costumed balls, expanded district Carnival Queen shows, greater focus on the Calypso tents in addition to the parties. His thinking was a shade in advance of the birth in 1958 of what would later lead to Panorama, that formidable presentation of the best in steelband music, not merely in Trinidad and Tobago, which had given birth to the steelband, the only new musical discovery of the 20th century, but in the Caribbean, and as the years went by, in the world. Bain would have all of this centrally marketed. His time at the Tourist Board had seen the utilising of the Katzenjammers Steelband to regularly welcome tourists coming ashore from the Moore-McCormack liners - Brasil, Argentina and Uruguay - as well as other cruise ships, with the playing of Calypsos and popular songs of the day. The Katzenjammers would be stationed at the Southern entrance of the then King's Wharf Passenger Centre. It was a showcasing of steelband music, although it should be emphasised, not limited to Carnival itself, particularly as the Moore-McCormack cruise ships, a feature of the 1950s and what have you, called once a fortnight throughout the year. Sometimes, there would be Calypsonians singing songs that, probably, would have been heard before by the visitors, for example "Rum and Coca Cola". Bain felt that the playing by Katzenjammers and the singing of Calypsos readily recognisable particularly by North American tourists were but aperitifs to whet the appetites of the visitors for the greater feast which Carnival represented. It was clever marketing strategy through which Don Bain had hoped that some of the visitors, who tapped their feet to the infectious beat, or hummed tunes with which they had been familiar, would have sought to fit Carnival into their schedule one day, or be the country's conscious and unconscious promoters of what even then was being saluted as "The Greatest Show on Earth". The Brazil Carnival, with its female revellers in skimpy, indeed daring costumes, most of their gyrating bodies sun kissed, attracted scores of the wealthy and famous from North America, including Hollywood stars, whose names were as familiar the world over as the Coca Cola soft drink, the inclusion of whose name in a 1940s Calypso would give the artform its greatest boost. The Rio Carnival, although promoted by the Brazilian counterpart to the Trinidad and Tobago Tourist Board as a four-day affair, had as additional promotion the several costumed balls and parties in the run up to the fun filled weekend. North Americans, what with their moral codes which decades ago had frowned upon the near nakedness exhibited all too often in Brazil's Carnival, and which was denied them even at New Orleans' fabled Mardi Gras, flocked to Rio de Janeiro to "free up", to use a cliche, and free up they did. Soon, Rio's Carnival marketed itself. At the other end of the equation Martinique, which like Trinidad and Tobago was Caribbean, had a novel approach - a three-day street festival in which masqueraders came out on Carnival Monday and Tuesday in colorful costumes, and to street dance in black and white on Ash Wednesday. The relative marketing failure of the Martiniquan Carnival can be gauged by the swarm of middle and upper income Martiniquans who came to Trinidad even from as early as the then famed Arima ball kick off to Carnival, and stayed for the other costumed balls and the two-day Festival. Bain set his heart on the advancing of the proposition of a month long Carnival Season. His idea was to promote the features of the pre-Lenten Season, the Calypso tents, the later fillip provided by the Queen's Park Savannah special Steelband competition; organised visits to panyards as well as centres where elaborate costumes were being created. In turn, there were the costumed balls, the Carnival Queen shows all over the country, culminating with the Carnival Queen show at the Queen's Park Savannah; the stick fighting competitions; Kiddies Carnivals, and the list is endless. 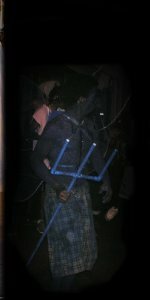 It was Bain who would play a critical role in the decision to include a Carnival segment, which would include the Julia Edwards Dance Company, in the film "Fire Down Below", shot in Port-of-Spain and Tobago in 1956, and additionally for the film company to produce a special feature. The outside world, or rather a sizeable part of it would be introduced to the Limbo! The pre-World War 11 period of Don Bain's youth would have seen the ushering in of the Carnival Season literally early in each New Year, particularly in the smaller towns and rural districts, where individual costumed figures would go from house to house singing old time Calypsos, and 'Wild Indian' chiefs would march through the streets to their tents, followed by awe struck youths. Ironically, a lot of what Bain advocated for this country's Carnival has been adopted by several South American countries, and Trinidad and Tobago newspapers this year carried photographs of many a costumed Latin American mas' character. We missed the boat, and today instead of the pleasingly sensible diffference suggested by Don Bain's initiative, and which had it been aggressively marketed would have drawn more and more visitors, we have settled on being carbon copies of Rio's Carnival! Hopefully, the long term vision of the former Royal Air Force officer will be taken up. A happy, safe and enjoyable Carnival to all of my readers, and indeed the whole of Trinidad and Tobago, and the thousands of visitors expected and/or already here.